Since Windows 8, which Microsoft decided to remove the Start button and Start Menu, Windows operating system has also included a hidden menu dubbed Power User Menu. Power User Menu is a right click pop-up menu that adds an very convenient, quick and easy way to access a single menu that consolidates shortcuts to various management, configuration and other advanced Windows system tools and utilities, which on previous Windows versions scattered across different places in Control Panel, Start Menu, or even only can manually executed via command line interface (Command Prompt). The Power User menu is also known as Quick Access Menu, Windows Tools Menu, Power User Task Menu, Power User Hotkey Menu, Expert Menu, Admin Menu, WinX Menu, Win+X Menu and etc. The fact that the Power User menu is “hidden” means that there is no visual cue to its existence. Via keyboard: Press Windows + X keyboard shortcut. Via touchscreen: Press and hold on the Start button or through a style that supports right-click action. The Power User menu will pop up from the bottom left corner. Programs and Features – uninstall programs. Mobility Center (only on notebook, netbook or tablet PC) – adjust mobile computing options such as display brightness, volume, battery status, external display connection, presentation mode, sync settings and etc. Power Options – change power plan. Event Viewer – view system logs. System – view system properties and information. Network Connections – view and manage all your Ethernet, Wi-Fi, VPN and other network connections. Disk Management – access disk partitioning utility. Computer Management – easy access to the powerful utility located in Administrator Tools of Control Panel. Command Prompt – easy access to command line interface (switchable to Windows Powershell in Windows 8.1 or later). Command Prompt (Admin) – run a Command Prompt with Administrator privileges (switchable to Windows Powershell (Admin) in Windows 8.1 or later). File Explorer – also known as Windows Explorer. Search – bring out the Search of Charms bar. Run – display the Run dialog box. 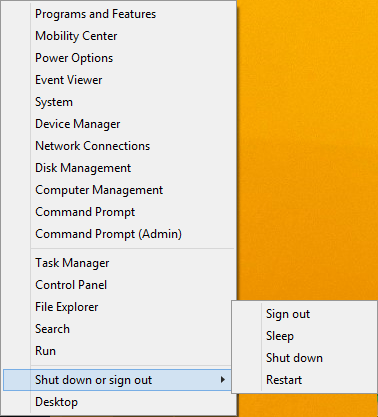 Shut down or sign out (on Windows 8.1 or later) – allow you to Sign out, Sleep, Hibernate (if enabled), Shut down or Restart. Desktop – go back to traditional desktop user interface, or if you’re already at the desktop, minimize all open windows. The entries on the Power User Menu are located in %LocalAppData%\Microsoft\Windows\WinX. It’s separated into 3 groups, reflecting the 3 major sections in menu. However, you cannot manipulate the shortcuts within the location as Microsoft protects the shortcuts with hash salt, and Windows will only display approved shortcuts. Thus, changing the Power User Quick Access Menu is not recommended. If you must change or add items to the Power User menu, check out the hashlnk tool which will generate and apply the required hash to the shortcut links in WinX folder so that they are deemed “approved” by Windows on system startup, and showed in the Quick Access Menu.